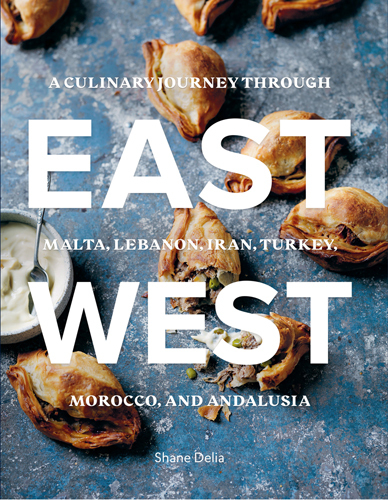 East/West: A Culinary Journey Through Malta, Lebanon, Iran, Turkey, Morocco, and Andalusia, written by Shane Delia, features 80 recipes inspired by Delia’s travels through the Mediterranean and Middle East. Highlights include Argan Oil Chocolate Mud Brownie with Orange Cinnamon Ice Cream from Morocco; Roast Peanut Butter Parfait, Tahini Salted Caramel, and Broken Baklava from Lebanon; Tortillas de Cameron’s and Pork Belly on Brioche Buns from Andalusia; Icli Kofte with Garlic Yogurt and Brown Butter from Turkey; Quail Egg Kefta Tabriz from Iran; and Stuffat tal-fenek (Rabbit Stew with Raisin Gremolata) from Malta. Shane Delia is an award-winning Maltese-Australian chef based in Melbourne, Australia with his wife, Maha, and two children. He is the star of the show, Shane Delia’s Spice Journey, presenter on Channel 9 Postcards, and owner of Maha restaurant and Biggie Smalls Kbabs. He is also the author of Maha: Middle Eastern Home Cooking. Disclaimer: I received this book from Interlink Books in exchange for my honest review. All comments and opinions are my own. This post contains affiliate links. Chapters are divided based on country: Malta; Lebanon; Iran; Turkey; Morocco; and Andalusia, Spain. At the beginning of each chapter, Delia includes an introduction with history, beautiful photography, an illustrated map, and insights into his travels. He starts with the home of his ancestors, Malta. He visited Malta with his family at the age of 14 and discovered his father’s hometown of Zejtun firsthand. His detailed writing style transports you to the streets and eateries right alongside him. The design of the book is absolutely stunning with photography by Rob Palmer. Every recipe is accompanied by an incredibly styled full page photo of the finished dish. Measurements are provided in US Customary and Metric. The titles of the recipes are listed in English and headnotes, preparation time, cooking time, and serving size are also included. To be honest, when I first received the book, I was a little intimidated. At first glance, the recipes seemed complicated and a large portion of my kitchen was still in boxes due to a move that occurred a month before planned. As I looked closer and started to try the recipes, most weren’t difficult at all. Steps can be broken down for many of the dishes and the results are restaurant-quality flavors in the comfort of your own home. This book is a great pick for those looking for unique and interesting dishes with Middle Eastern and Mediterranean flavors. The recipes may not be best for complete beginners, but are perfect for those looking to try new techniques or experiment with flavors. I especially see myself pulling out this book when entertaining or looking for something impressive. While many ingredients can be found in larger American grocery stores, some items may require a trip to a Middle Eastern market such as Aleppo pepper, sumac, sabaht baharat, rabbit, golden raisins, arak, orange blossom water, haloumi, carob molasses, Middle Eastern cotton candy, sucuk sausage, ras el hanout, argan oil, lamb tail fat, saffron, kataifi, and more. Delia includes a short pantry guide with descriptions and substitutions for some of the lesser known ingredients. 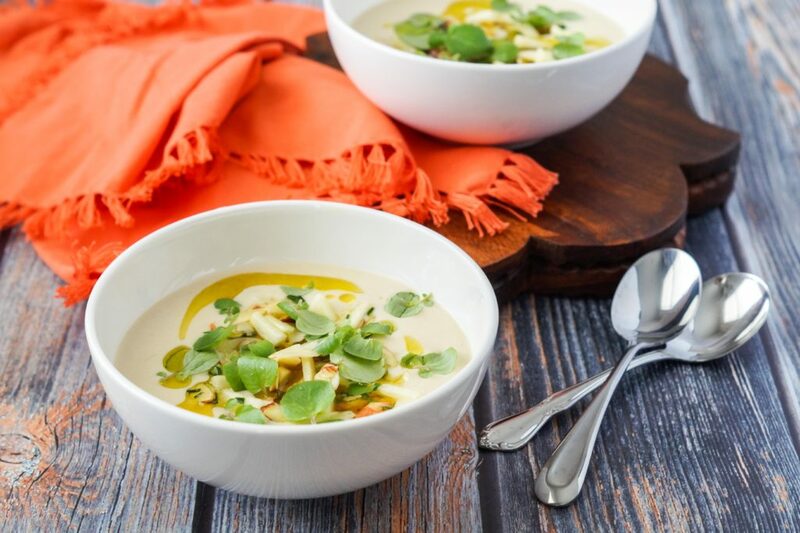 As the temperatures outside start to rise, this Moorish Chilled Almond and Orange Blossom Soup with Apple and Watercress Dressing is a delicious way to cool back down. Don’t let the long name and list of ingredients throw you off. This soup was actually fairly simple to prepare. The soup base is made with the quick whirl of the food processor. Almonds, garlic, bread, and apple are blended together to form a paste before mixing in the water, olive oil, orange blossom water, and a little sherry vinegar. It is topped with a spicy citrus shrimp mixture and a refreshing apple and watercress dressing. Chad usually isn’t a fan of soup, particularly chilled soups, but he polished off two bowls and asked when I would make it again. Claire especially enjoyed it as well. The original recipe uses chopped raw shrimp that is cured for 30 minutes with lemon zest, cilantro, and red chili. I grilled the shrimp first since I was sharing it with my two year old. If you use raw seafood, buy it from a trusted source. Consuming raw or undercooked meats, poultry, seafood, shellfish, eggs or unpasteurized milk may increase your risk of foodborne illness. Orange blossom water (orange flower water) is made by distilling fresh bitter orange flowers. It is often used (in small quantities) in Middle Eastern and French cuisines to flavor cakes, pastries, and other desserts. It adds a floral and slightly bitter taste. I have seen it in the spice section of larger supermarkets next to the extracts. It can also be found in markets featuring Middle Eastern ingredients or on Amazon: single and four pack. 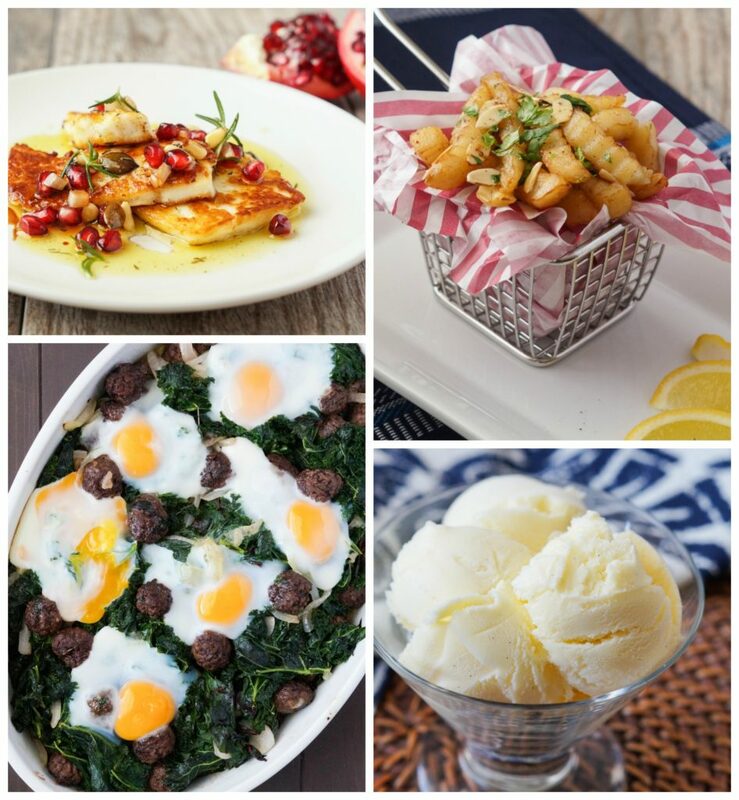 I also made the Grilled Haloumi with Pomegranate and Sumac Dressing; Spicy Dahlia Fries; Wild Greens with Sucuk Balls and Eggs; and Cordoba Olive Oil Ice Cream. The Grilled Haloumi with Pomegranate and Sumac Dressing is inspired by the toasted haloumi and za’atar sandwiches of Lebanon. The recipe is fairly simple, but packed with flavor. Slices of Haloumi cheese are grilled until heated through. They are topped with a spiced pomegranate and sumac dressing with onion, pine nuts, and pumpkin seeds. The Spicy Dahlia Fries are another Lebanese-inspired treat. Delia was introduced to them by a woman named Dahlia who had a pop-up fish restaurant called Cloud 59 on the beach in Tyre. Frozen french fries are the base for an assortment of spices, toasted almonds, garlic, and a drizzle of browned butter for good measure. Delia recommends serving the fries on their own as a snack or as a side for grilled fish. The Wild Greens with Sucuk Balls and Eggs comes from the Turkey chapter. This was definitely the perfect dish for a weekend family dinner and was delicious served with crusty bread and yogurt. Small meatballs are browned until caramelized and tossed with blanched greens. It is transferred to a casserole container and topped with eggs before baking just until the egg whites are set. This one was Chad’s favorite. Delia created the recipe for Cordoba Olive Oil Ice Cream to feature the high quality olive oil in Andalusia. The rich ice cream base has flecks of vanilla bean throughout and a strong, olive oil flavor. It is churned in the ice cream maker until chilled and creamy. In a large food processor, combine the almonds, garlic clove, bread, and apple. Process into a paste and slowly drizzle in generous 3/4 cup water, then the olive oil, and 1 1/2 tablespoons of the sherry vinegar while the machine is running. Stir in the orange blossom water and season with salt to taste. Transfer to an airtight container and refrigerate until chilled, about 2 hours. Finely chop the shrimp and place in a medium bowl. Combine with the chili, cilantro, lemon zest, salt to taste, and remaining sherry vinegar. Drizzle with 1 tablespoon olive oil, cover, and refrigerate for 30 minutes. To make the apple and watercress dressing: In a bowl, toss together the apple, almonds, chives, and watercress. Drizzle with enough olive oil to coat and season with salt to taste. 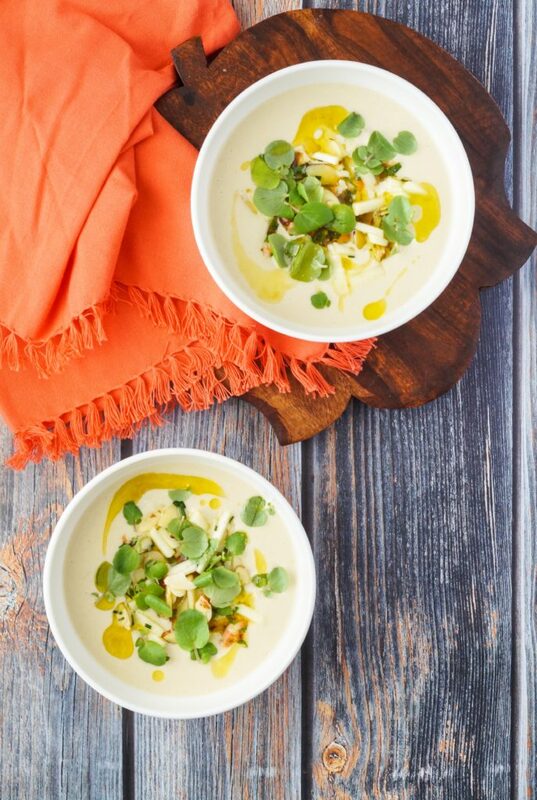 Divide the chilled soup among serving bowls. Top each with the shrimp mixture, then the apple and watercress dressing. Drizzle with a little olive oil and serve immediately. I can just imagine how good this soup smells with a hint of orange blossom water. Such good stuff! This looks delicious and refreshing. I love the flavors you’ve included in this recipe. Thank you for sharing! Luci’s Morsels | fashion. food. frivolity. What an interesting article! 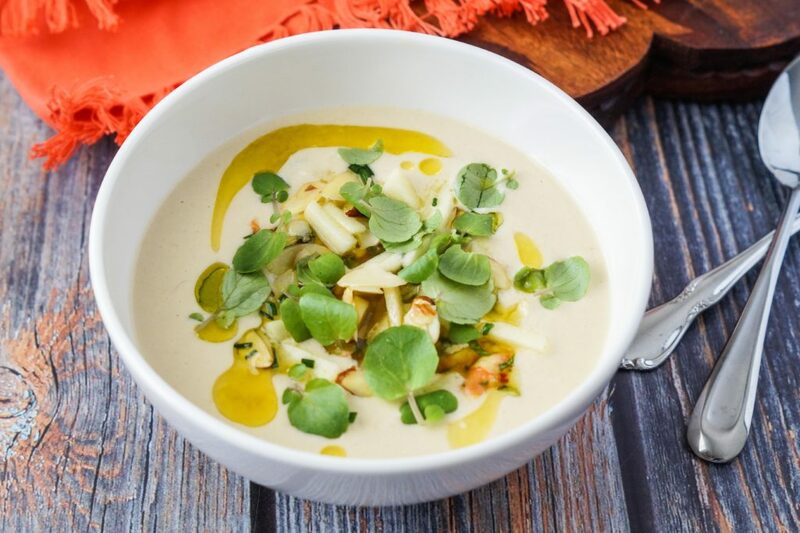 I love the ideas and the soup recipe – very different and sounds lovely. This must be the most interesting soup I’ve ever come across! Love the flavor combo. The book sounds great, going to have a closer look if I can find it around here! Wow, all of those recipes do look impressive. I love all the bright colors.